LONDON The Namaz-e-Janaza (Funeral prayer) of Begum Kulsoom Nawaz, wife of former prime minister Nawaz Sharif, will be offered today (Thursday) in London’s Regent Park mosque. PML-N president Shahbaz Sharif and other family members reached London on Wednesday night to attend the funeral and bring Kulsoom’s body back to Pakistan. A PIA flight carrying the casket will fly from Heathrow airport at 10pm today. It will land in Pakistan on Friday at 6am after which a second funeral prayer will be held at Jati Umra in the evening. Kulsoom will be laid to rest the same day beside the grave of her father-in-law Mian Sharif at Jati Umra. Kulsoom was born in 1950 in Lahore to a Kashmiri family. She attended Islamia College and graduated from Forman Christian College in Lahore. She also received a Master’s degree in Urdu from the University of the Punjab in 1970. She married Nawaz Sharif in 1971, and served as the president of the PML-N from 1999 to 2002. 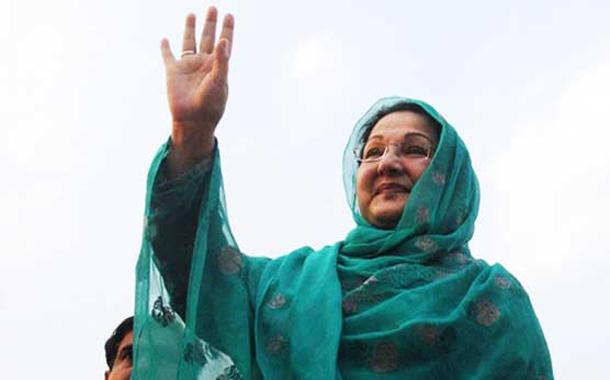 Kulsoom had remained the first lady of Pakistan for three non-consecutive terms from 1990-1993, 1997-1999 and 2013-2017.